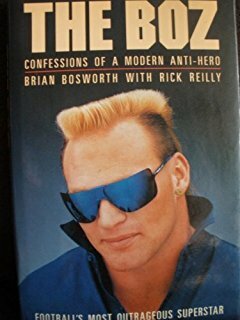 The nights lengthen, the days grow colder, and our allotted days slough away — but, on the plus side, we welcome the world’s best sportswriter, David J. Roth, to endure the 252 pages of book-like object The Boz, Confessions of a Modern Anti-Hero, attributed to (or perhaps simply blamed on) Brian “The Boz” Bosworth and Rick Reilly. It’s time to ask yourself: “Do you like football?” Well, we’re talking about it either way. What’s this book like? It’s like sitting next to a guy telling you — lengthily — about each of his conquering moments as a high school athlete while a sherry-drunk golf dad lazily jumps in to punch up the stories with rejected pitches to Mad Magazine’s “Snappy Answers to Stupid Questions”. The episode, however, is like bathing your ears and very soul with three friends making fun of a guy telling you lengthily about each of his conquering moments as a high school athlete while a sherry-drunk golf dad lazily jumps in to punch up the stories with rejected pitches to Mad Magazine’s “Snappy Answers to Stupid Questions”.